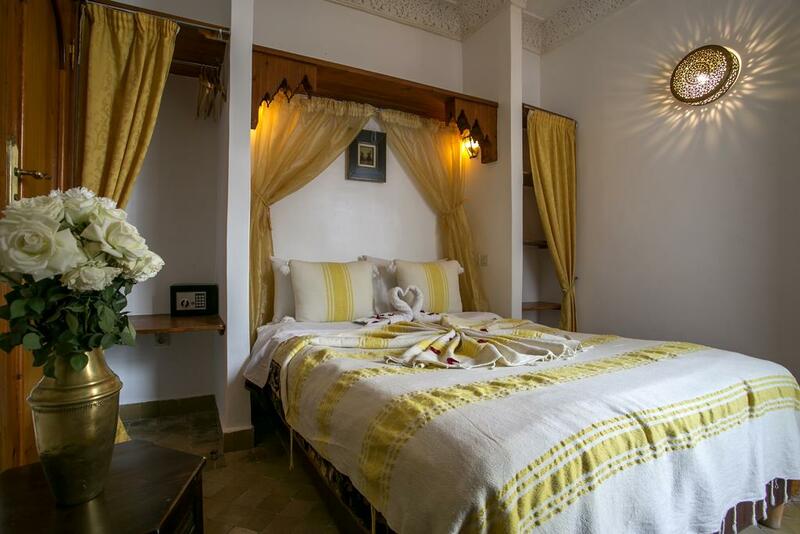 With an area of about 14 m², it is located upstairs at the end of a beautiful passageway with stucco and beautiful lanterns typical of Morocco It is nestled in an angle and overlooks the pool pool and weir (that we stop the night). 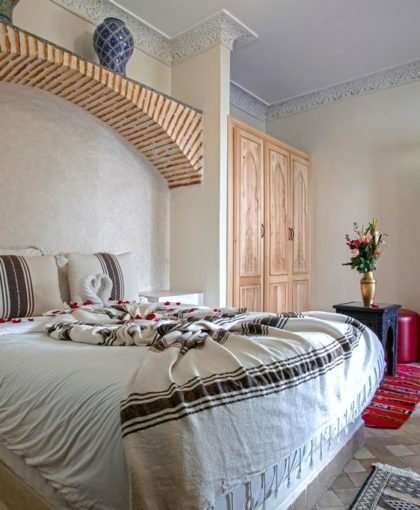 Its ceiling is adorned with handmade stucco. 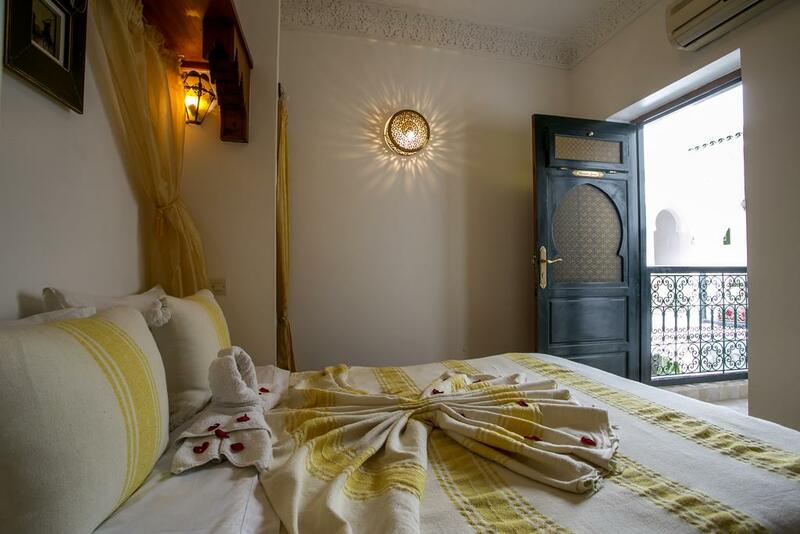 A beautiful door made in Morocco, and clean shutters of the old riads, create an appreciable intimacy. Downstairs, the bhou invites you to relax and the dining room awaits you for breakfast served every morning from 7.30 am to 10 am or for a meal (lunch or dinner) that you will have, if possible, booked the day before. Upstairs the terrace awaits you with its solarium and deckchairs, a large pergola, benches, cushions and rugs to relax or take a breakfast. 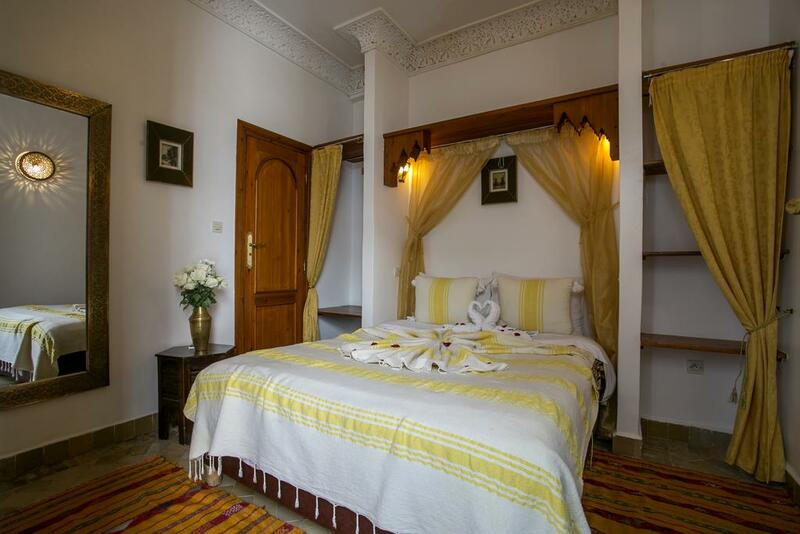 At the riad, all rooms are fitted with a wardrobe. 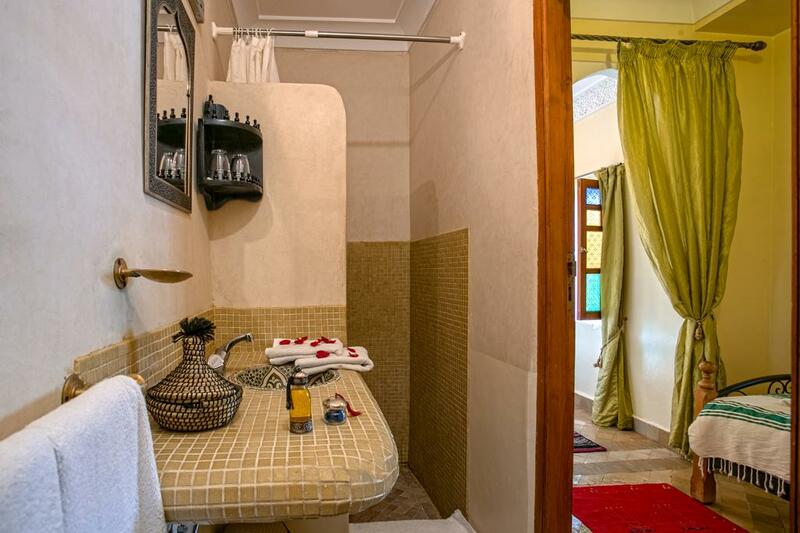 The private bathroom is fitted with free toiletries. 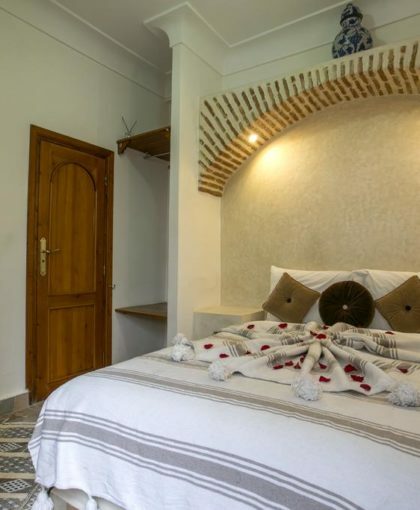 All units feature a safety deposit box. 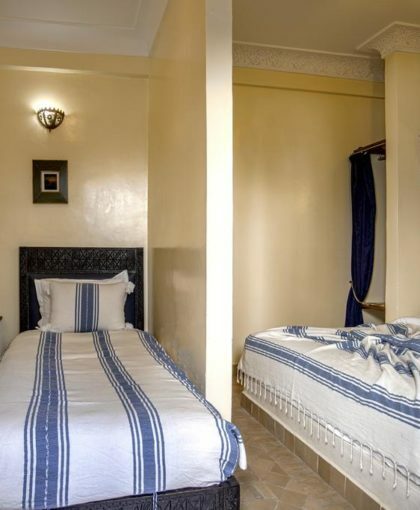 Private parking is possible at a location nearby (reservation is not needed) and costs EUR 4 per day. 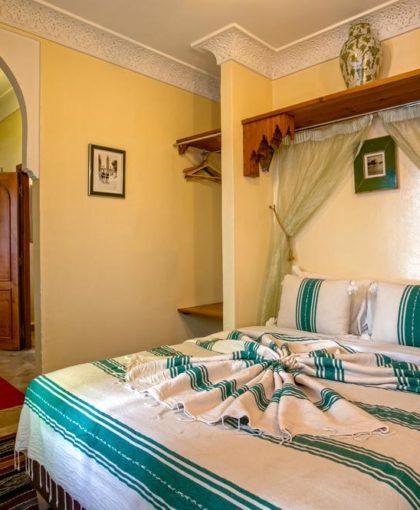 With an area of about 20 m², it is located upstairs with access by a beautiful corridor overlooking the fountain and its weir (that we stop at night). 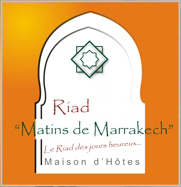 Book a trip to Marrakech Riad Matins of Marrakech is to prepare a stay in Morocco and unforgettable holidays! 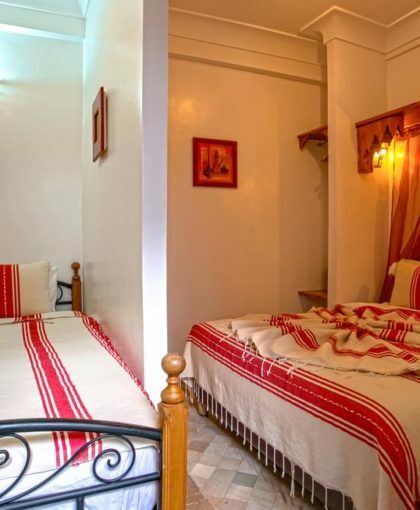 Since this beautiful riad, with its colors, its brightness and its serenity.